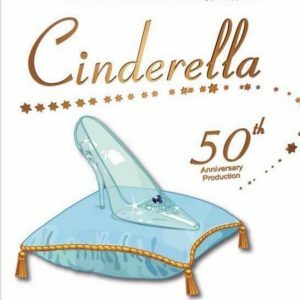 50 years at Burnham: Cinderella goes to the ball again! I always enjoy my journey to the Princess Theatre and Arts Centre. 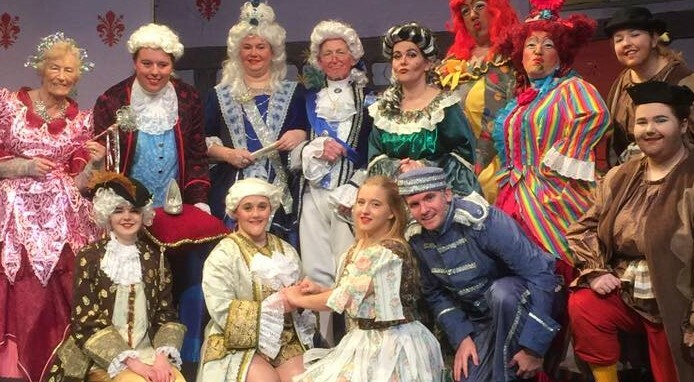 On this occasion Burnham District Pantomime Society celebrates its fiftieth year. Their first production back in 1970 was Cinderella. How fitting to introduce the same tale for their Golden Anniversary. Once again, I received a very friendly welcome from this society and thank you so much for our interval refreshments. A warm venue greeted me with background music to take away the chill of a January evening. The theatre was appropriately decorated with pumpkins, mice, brooms and silver slippers. Your eight clocks had a striking resemblance – they had all stopped at midnight! Attention to detail, no matter how small, makes a huge impact and it was here that you really scored. Lorna Blair was once again in the hot seat as director assisted by Greg Fear. The script, provided by Limelight, contained all the necessary ingredients of a traditional pantomime. Incorporating plenty of humour and a neat balance of songs, this was an excellent well-rounded script. With just one prompt required the pantomime progressed with pace, the first act completed within the hour. Exactly how I like it! In terms of direction, the show contained many contemporary allusions and full use was made of the available space including the rear of the theatre and balcony. Every set, painted by members of the society, added appeal to the production and all props (there were plenty of them) were used imaginatively. In particular, I loved the idea of your bailiffs retrieving old ‘panto props’ from bygone years. Very clever was this. The casting of any pantomime can present challenges but it was clear you achieved this admirably. Here are a few that I would like to mention. Greg Fear’s Buttons gave us a lovable character. You worked extremely hard on your character Greg. It was obvious you were feeling unwell with such a bad throat and I guess that you would rather have been home in bed with a ‘Night Nurse’ than treading the boards! You were energetic and fun to watch playing your part exactly as a linkman should. ‘Button’s, where’s your hat’ was a good running gag and added visual appeal on each of your entrances. Katie Shephard’s Cinderella was sweetly portrayed. You held the stage well Katie with both voice and movement. Occasionally your diction was slightly hurried. Having a lovely singing voice and stage presence, this is exactly what we expect from our Cinderella’s. Val Homes’ Fairy Godmother is exactly how I imagined a Fairy Godmother to be. You were very graceful Val. On occasions you needed to look out to the audience rather than just home in on the front rows. You took your time with your delivery and received a wonderful applause on your final bow. Emma Twigg’s Baroness Hardup was deliciously nasty. From the moment you walked on stage Emma you held your audience. You worked extremely well alongside those desirable daughters of yours and overall gave a commanding performance. I felt the stars of the show were the Ugly Sisters Dolce and Gabanna played by Rob Manlow and Chris Bissell. What impeccable pairing! It was evident you had worked extremely hard on your characterisation and it certainly paid off. 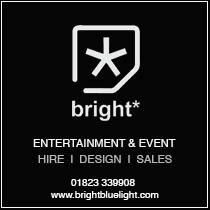 You both gave a polished performance from your first entrance until the finale with strong entrances, superb energy and a fast pace of delivery with excellent cueing of the one-liners and punch lines. The bedroom scene was well rehearsed and your timings spot on. A magnificent performance. There were some lovely up-beat numbers including original lyrics thanks to the talents of Xavier Underwood. What a fine team of singers you have too. I very much enjoyed On Your Noggin’,Gimme, Gimme, Gimme and Be Our Guest. I did feel the music drowned I’m So Excited which was a pity. Lighting and sound effects added appeal to the show and all costumes were society made looking majestic on stage. Although I felt momentum was lost during the house number, the production moved briskly along. This was without doubt a wonderful traditional pantomime. I certainly enjoyed celebrating fifty years with you.